Only The Best For Your Special Event. To please our loyal customers, as well as the new clients the Riga Limo Service we have various offers for different type of events and transfers in Riga. Taking into account diversity of the customer requests for their transportation needs in Riga, we offer specially created packages with the most demanded additional services at very attractive prices. Our special offer applies to different types of services like Riga stag or hen party rides with stretch limousines, sightseeing with minivans and professional guide service, night life rides with sparkling drinks and many more. If you have some interesting ideas on your mind, which you do not find between our special offers, let us know, we will make sure to make it come true. Our mini buses are equipped with comfortable seats, air conditioner, great sound system and TV - everything to make your ride pleasant. 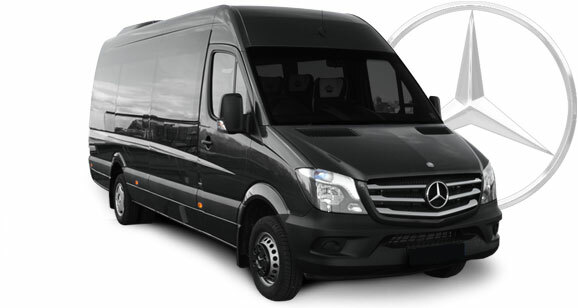 Choose Mercedes Benz Sprinter VIP for the Riga airport transfer for the groups up to 19 passengers. What is a real bachelorette party without a male strip show? To make every bachelorette party in Riga spicier, the Riga Limo Service offers luxury limousine ride with Chrysler 300C Super Stretch that can accommodate groups of up to 7 persons plus one hot Riga stripper for your show. Enjoy the ride in the Hummer H2 Super Stretch limousine with one beautiful striptease dancer. Perfect for the stag groups, great beginning before your wild party night in Riga. Suitable for 18 persons plus one hot Riga stripper for your show.